ISO 14644 Part 1 is a useful guideline to maintain the good manufacturing practices in sterile pharmaceutical manufacturing as well as the oral dosage forms. This document provides the standards for the clean room classification. Revision of the guidance was started since 2007 and its drafts are already published in 2011, 2012, 2014 and 2015 but none was finalized and 1999 version was applicable and expecting a new version. 2. 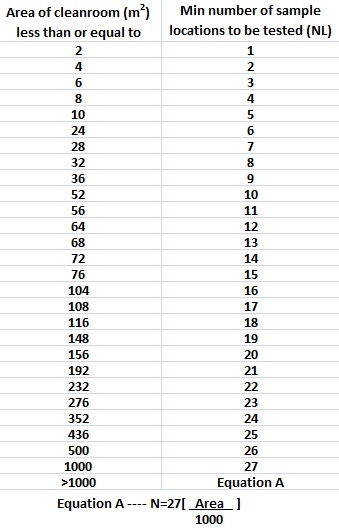 The number of sampling points in the area is no longer calculated as the square root of the surface area formula but it is now taken from the table given below. 5. UCL calculation is not required now: there is no need to perform an observation of all measuring points in the room any longer. Each single measuring point is considered individually and has to meet the limit value. 7. The classification number, the air sample volumes, measuring time as well as the cancellation criterion is not changed and remains as same to the version ISO14644-1:1999. All SOPs and qualification protocols in pharmaceutical manufacturing related to the HVAC system and cleanroom management should be changed accordingly. please is there any mistake , it shows on area of 68 m2 is 12 locations, but for 64 m2 is 13 locations !! yes that was a typo mistake and has been corrected. let me know recent usfda guidelines for purified water/wfi and hvac. is it reqired to monitor temperature and humidity for non classified areas in periodic performance qualifications. pls give me answer sir. we are monitoring 8hrs readings with interval of 30 minutes for each rooms after every two years periodic performance qualification for all AHU. Yes, you should monitor storage areas for humidity and temperature. Dear sir can we refers these sampling location for RLAF unit. 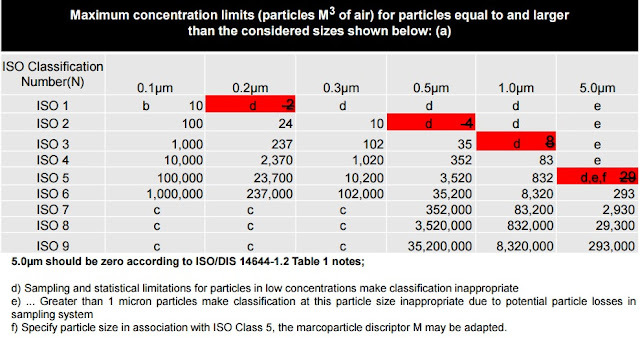 what is the new limit of particle count of ISO-5 Rest & operation conditions.